The intention of this meeting is to learn and grow in meditation through the practical experience of ourselves and others in a community environment. Many people in recovery are intimidated and confused about how to approach meditation and prayer. For many the belief in a Higher Power is still a sketchy notion. But the truth is that this is the very thing we must come to terms with... the not knowing in an intellectual or physical way.... and giving over control to the Higher Power within us, which is and will remain a Great Mystery in many ways, no matter how much we grow spiritually. This is opened, fostered and accomplished through prayer and meditation. In this class we will explore meditation and prayer practices, and focus on surrendering to conscious contact with a Higher Power. "We admitted we were powerless over our addictions and that our life had become unmanageable." We use this step to surrender...to meditation and prayer. We admit that because we are not actively engaged in meditation and prayer, that this is just another form of addiction. It is this step that will help us learn how to meditate, to break through the blocks and belief systems about meditation.... of not being able or not deeming it important to meditate... To admit that this is still just an attachment to an old belief system that tells the addict that they have to figure everything out cognitively with the surface thinking mind. The resistance to the eleventh step, through prayer and meditation is one of the main underlying addictions in another form, that stops our spiritual growth and creates unmanageability, because it still flies below the radar as all of the attention is on the "outward" addiction(s). 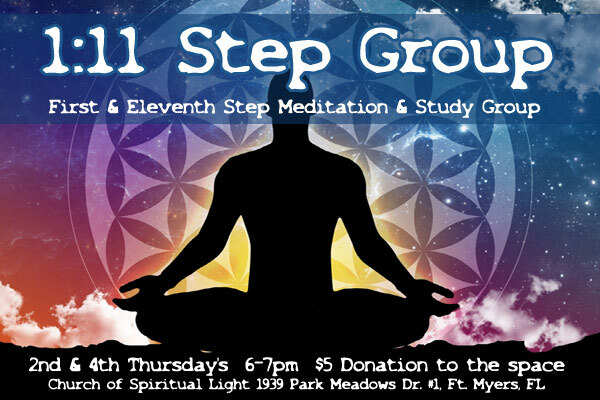 In this class we will work in a sacred space that is 100% devoted to spiritual growth to meditate, to learn more about meditation, and to establish that conscious contact of the eleventh step. This class is for anyone, even if you are not actively in a 12 Step program or group. Come as you are. These two statements are like a lock and key. The NOW exists on the inner planes of our being. When we don't work with the inner, there is no now for us... everything remains linear and segmented. Cause and effect only happens in times and space as we look outward. When we work in the present moment... ironically it uses time to our advantage, and we can tap into a new realm of cause and effect. We talk about the Secret... but this is the real secret... the place that exists outside of linear time and physical space... that this realm is as real as any other reality in any other realm brings us to the Now....the place of miraculous creation. We realize that when we step outside of time and get into the now, we can only be in communion, in oneness. It is a byproduct of that state. When we are focused outwardly on circumstances and situations that are outside of ourselves and holding them apart from ourselves, we have just stepped out of the now and into clock time. Perfecting now does not mean that we are in sitting meditation all day. It means that we are mindful and present to every nuance of our existence that we have the eyes to see and the ears to hear. It means that we do the work to open and sharpen our skills of observation so that we can get into the Gap of our lives. Getting present might mean that you confront someone. Because unfinished business keeps us either mourning the past or fearful of the future in some regard. This robs us of the NOW, as we end up using our precious energy to babysit some unspoken specter. In truth, we are being called to perfect our ability to defy gravity through the power of the illumined mind to work with time, inside of the sacred space of our own heart... for the purposes of coordinating, gathering and communing in the physical with each other. This is practice for the day when we will commune telepathically through a greater force than we now know that rules our lives. As we come clean with ourselves and each other, this possibility becomes an ever deepening reality. This kind of kinship and communion is the re-unification of God's journey. Humpty Dumpty isn't looking to be put back together the way he was, not just because it's not possible... but because as he sat on that wall and fell back down to earth he was forever changed... he was broken open... just as we expand and grow we no longer fit into our old notions of who and what we are. As we realize this, the closer we get to God, the closer we are to each other. We are emerging something together here greater than the sum of it's parts. But in order to do this, in order to receive the future recall, the visionquests and the dreams, we must be present... we must be in the presence of our own soul. Being one means that we are together, not the same. And being together means that we are of one mind, one heart and one soul. One mind does not mean that we think alike. One mind means that we have wisdom, love and understanding, and that we realize what a treasure our unique view, and another's unique view brings to the whole. It means that we foster our unique individually to benefit the greater whole. As we realize our place in this world, enjoy the richness of our diversity, we harmonize this multi-verse into one song... the uni-verse. Not by sounding the same note, but by listening for the harmonics of our soul signatures to help us come together in perfect synergy and harmony. We realize that physical space and our bodies are truly the only thing at this point that separate us and with the understanding that this separation is not the whole picture of reality we do not tell ourselves the lie of separation. We KNOW that even if we are not aware that what we do and who we are affects the whole. We can be of one mind, as we bring in the Light of the Soul and enjoin with the mind of God, however, you see the source. This is perfecting now. I am present to my life, to myself and to others. I strike out on my new journey with renewed faith, hope and love. I speak my truth with love and compassion. I allow others to speak their truth with love and compassion. I understand the difference between my truth and universal truth. I am filled with the light of angelic forces within. I call to my spiritual guides and guardians for guidance and assistance. I am a force for good in the world. I allow all that I am to fully integrate into my being. I operate with the highest levels of integrity that I am capable of. I release the bounds of illusion and the wall of denial that keeps me from my soul. I authenticate and validate my true self. I accept myself unconditionally, as I honor my transformational process. I trust in the wisdom of my spirit, to inform my life and lead me to my higher self. I treat my body and mind as a sacred trust. I see the holistic view of every situation. Everything we see is connected on levels that we can barely imagine, with things that we cannot see. I honor the interconnectivity of all that is. I am open to the expression of my highest creativity. I acknowledge the power of humility to bring me to my creativity. I surrender to the love within my soul. I trust the creator, the master of the divine plan and see the brilliance of this creation. Whatever I am experiencing is exactly what I need to more fully claim my free will. The wisdom of my higher self is my guiding force. I see the Light, within myself, within others and this creation. I am open to the adventures of this magnificent journey called life. I am M.E., an ever evolving Moment of Eternity.